WATCHING Anthony McDonald-Tipungwuti light up the MCG with seven goals on Saturday afternoon was an Essendon diehard's dream. That career-best effort at Brisbane's expense followed his four majors the previous week against Melbourne at the same venue. Not so coincidentally, both of those solo 'Tippa' displays resulted in Bomber triumphs – and it's a trend his coaches might want to become familiar with. 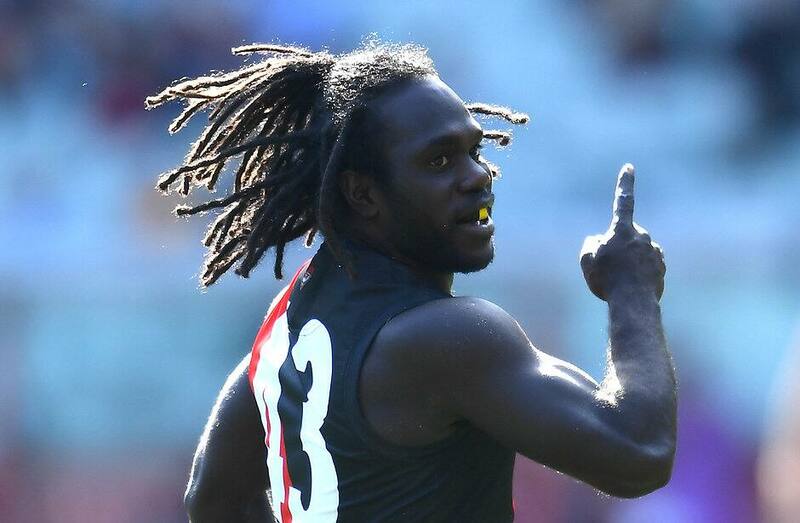 Essendon has won eight of nine matches when McDonald-Tipungwuti kicked three goals or more in his 70-game AFL career, after he started as a defender. On the other hand, his goalless opening two rounds this year came in defeats. The 171cm speedster from the Tiwi Islands first established himself as the Bombers' barometer when they signed off the 2016 season with a victory, including four McDonald-Tipungwuti majors. However, in a quirk, Essendon's big-name spearhead Joe Daniher can sometimes have the opposite effect on his team's fortunes. The Bombers won just once from seven contests when Daniher dragged in 10-plus marks. Further investigation reveals that only twice in those games did he kick more goals than behinds, lowlighted by his 1.6 haul against Melbourne in round six, 2017. Like McDonald-Tipungwuti, every side has a not-so-obvious player whose performances align with success. Does that make them the firestarter or a downhill skier? That's for others to decide. AFL.com.au, with help from Champion Data, has identified the individuals who fit that definition at your club. Who is your club's not-so-obvious barometer? An emphasis was placed on recency, with nine of the selected players and their associated statistic reflected in round four wins. Some of the correlations are better than others, with Demon Christian Salem (disposals), West Coast's Tom Barrass (marks) and Bulldog Caleb Daniel (uncontested possessions) among the strongest. However, finding a candidate at Brisbane, Carlton and Gold Coast proved tougher, given the last time any of those clubs won more than seven games in one season was the Suns in 2014. The Lions and Blues options therefore have negative records, although at higher rates than their side's win-loss ratio in recent times. As for Gold Coast, recycled Carlton discard Nick Holman emerged as the most interesting name in this process. Holman arrived at Metricon Stadium ahead of the 2018 season and fresh from two years in the SANFL after his delisting. The Suns have won seven matches since – three of them this year – and the 23-year-old has won at least eight contested possessions in all of them. Gold Coast's sole loss in 2019 came with the tireless Holman out of the line-up. Wayward goalkicking continues to deny the scoring spike that was supposed to follow as part of the nine new rules and interpretations. Shot-at-goal accuracy has plummeted to 45.9 per cent – the worst since Champion Data began monitoring missed shots along with scoring shots in 2002. The figure was 53.7 per cent in that first year and has gradually decreased, but the drop-off from 48.9 per cent at the same time last season is dramatic. It dipped to 47.3 by the end of 2018 and continues to fall. Scoring shots are only slightly below this time in 2018 (1827, down from 1880), but there are stark differences in goals (839, down from 920) and missed shots (352, up from 297). The average team scored 12.8 goals and 11.2 behinds in the first four rounds last year, whereas this season it's 11.7 goals and 11 behinds. It's hardly breaking news that Carlton co-captain Patrick Cripps carries a heavy load at the Blues, but his feats continue to amaze. Cripps extraordinarily leads the AFL in contested possessions, groundball-gets, total clearances, centre clearances, tackles and defensive-half pressure acts. However, there might be a different statistic that highlights his herculean efforts. Cripps is the sole midfielder in the top 20 for time-on-ground percentage – from those who have played three or more games – at 91.4 per cent.